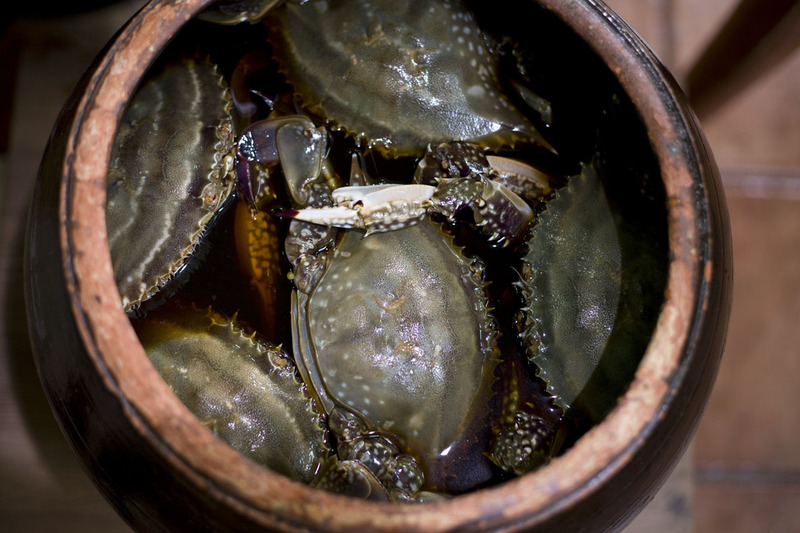 A memorable snack we ate in Korea was gejang, a famous Korean dish of marinated raw crabs. The crabs are soaked in soy sauce and chili peppers, and then left to sit and pickle for days until just the right amount of fermented. One of the best places in Seoul to get your gejang fix is Pro Ganjang Gejang, a beyond famous Korean restaurant run by Mrs. Baek-Ja Seo. At this establishment, the gejang is intensely flavorful, spotlighting Mrs. Seo’s signature marinade of soy sauce, chili pepper, and little else. After feasting on some delicious crab, she showed us how to eat the leftover roe mixed with rice and marinade for a second, incredibly satisfying helping. Her delicious soy marinated crabs are second to none, but Marja‘s got a great recipe in her cookbook that cuts the preparation time in half. Her secrets? Fresh live crabs from Hmart. Then, steaming the crabs in advance and marinating the crab overnight. The recipe also features a simple soy marinade that is not only incredibly tasty, but very versatile–it would be equally good with another protein, such as chicken or salmon. To check out Pro Ganjang Gejang, be sure to watch Episode 8: The Seoul Food Chronicles.